Water Street Hotel and Marina, a new hotel on the Apalachicola River in Apalachicola, Florida, Northwest Florida's Panhandle, near St. George Island and the Gulf of Mexico. Call the hotel directly for our end of summer promotions. Apalachicola’s newest hotel, the Water Street Hotel and Marina is a unique 30 suite hotel in an Old Florida setting. With today’s modern conveniences including a 19 slip marina, pool, meeting facilities and screened porches on the water, guests are greeted by a warm and welcoming staff. 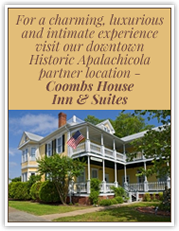 Only four blocks from the center of Apalachicola, the hotel’s beautiful turn-of-the-century look captures the solitude of life by the water. Apalachicola is a unique combination of history, culture and charm in a small community setting. Located just over the bridge from St. George Island from the east and a short trip from the city of Port St. Joe from the west, Apalachicola is the epicenter for fine dining, entertainment and shopping in the area. Quietly situated on the city’s working waterfront, the Water Street Hotel provides destination resort activities and amenities within walking distance of a wide array of restaurants, museums and boutiques. For centuries people have come here to fish, relax, enjoy the river and escape.